Sometimes your basic grill burger just doesn’t do the trick when you are trying to show off your culinary skills to new friends. 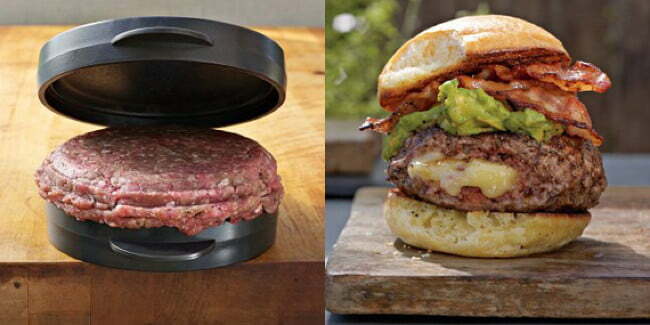 If you are loyal to the art of the burger, but want to spice things up a bit and really make their mouths water, it’s time to get your hands on the Williams Sonoma Stuffed Hamburger Press ($12). The press makes perfectly shaped patties, and after you’ve filled each side with the appropriate meat, add your favorite fillings in between for a stuffed burger ready to be slapped on the grill. Try adding cheese, caramelized onions, or chili peppers in the burger to leave more room for your favorite condiments on top. For less than fifteen bucks, this little press is an inexpensive and surefire way to out-grill that annoying neighbor who always brags about his meat-cooking skills.